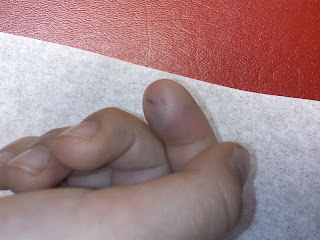 Gray came home with this injury today-theres a boy at his school that has hurt him on more than one occasion. When I saw this today I immediately rushed him to the doctor thinking a bone was broken. The student hit him hard with a wooden block-The teacher told me Gray was crying really hard and that his finger turned purple and started to swell right away. That black line is not marker, it's broken blood vessels. Im so pissed off I don't know what to do. When I asked about having the child removed they said, "It's MAY Jen"
The injury actually looks worse than my phone could capture. It looks like he just voted in an Iraqi election. That's why god invented lawsuits.